What is the most important innovation of the 21st century? The iPhone? Facebook? It is hard, really, to make a case for anything other than the process popularly known as fracking: the extraction of previously inaccessible oil and gas from shale rocks. Over the past decade, the US shale boom has transformed the country’s energy outlook, ending a decades-long decline in oil production and cutting natural gas prices by two-thirds from their 2008 peak. The income, jobs and tax revenues that the shale revolution has created have revived moribund industrial and agricultural areas, and encouraged hopes of a sustained recovery in US manufacturing based on cheap energy. Meanwhile, a shift in power generation away from coal towards gas has cut greenhouse gas emissions and other pollution. Most profoundly of all, the boom has changed Americans’ perceptions of their place in the world. No longer doomed to ever-growing dependence on imports of oil and gas from the Middle East, Africa and Latin America, the US can speculate about a future of self-reliance in energy. And although it started in the US, the shale revolution is now spreading around the world, with countries from Argentina to China beginning to develop their own reserves. Seeing all this as the result of fracking is something of a misperception. Hydraulic fracturing, to give the technique its proper name, is just one of the advances of the past 15 years or so that have made production from shale reserves possible. Fracking – pumping water, sand and chemicals into a well at high pressure to open up cracks through which the oil and gas can flow – has been spectacularly effective only when combined with horizontal drilling. Modern shale wells are no longer sunk like straws poked into the earth, but drilled down and then sideways for a mile or more, to open up a much larger hole through a layer of resource-bearing rock. Still, with its euphonious snap and vaguely obscene resonance, it is “fracking” that has captured the public imagination, and become a synecdoche for shale production as a whole. Many in the oil and gas industry dislike the word, because of its enthusiastic adoption by their opponents in the environmental movement. One executive describes it as “hate speech”, and it lends itself all too readily to coinages such as “frack off” and “no fracking way”. Some in the industry have tried to establish the spelling “fraccing” as a handy piece of neutral jargon, but they are fighting a losing battle: it is “fracking” that has entered the Oxford English Dictionary and is ubiquitous in non-specialist usage, including the first wave of books explaining it for the general reader. Even Ezra Levant, in his unabashed pro-industry polemic Groundswell, subtitles his book “the case for fracking”. In spite of the manifest benefits that shale production has delivered, it is still vigorously opposed by environmental campaigners. Concerns about possible contamination of water supplies by the chemicals used in fracking has prompted bans in some places, including France, Bulgaria and New York state, and stirred up protests in others, including Britain. The anti-fracking documentary Gasland (2010), by New York film-maker Josh Fox, attracted a worldwide audience with its alarming depictions of poisoned families and its dramatic footage of a man who can set the water from his kitchen tap on fire. Levant, a television commentator who is described on his website as “Canada’s foremost freedom fighter”, tackles those opponents of shale production head-on. 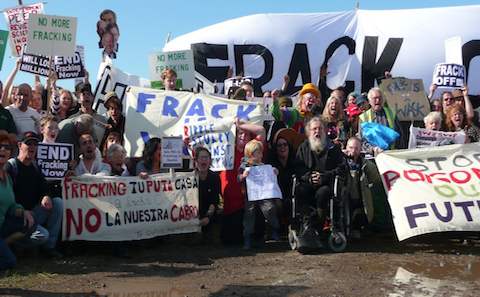 Fracking, he argues, is “the beautiful technology with the ugly name”, creating “plentiful, cheap, clean, democratic energy”, and concerns about its threat to the environment have been wildly overstated. His style is pugnacious, making little effort to win over sceptics with charm, and the book is littered with tendentious assertions. But his jabs hit more often than they miss, and his overall thesis is convincing. His detailed, almost scene-by-scene rebuttal of Gasland is particularly compelling, and it would be interesting to see an equally detailed response from Fox. Another strong chapter gives a whistle-stop tour of debates over fracking around the world, including a telling section on Ukraine, written before the latest crisis, explaining how shale production could be a “turning point” for the country’s attempts to break free from Russia’s hold over its energy supplies. If you are looking for ammunition for a dinner-table argument with ecologically minded but under-informed friends and relations, Groundswell is the book for you. For a more rounded account, you need Russell Gold’s The Boom: the best overview available of the history and consequences of fracking. An energy reporter at the Wall Street Journal who has been on the beat since 2002, Gold has seen the whole story from the beginning. His knowledge of many of the central people and places in the shale revolution from before they hit the headlines gives the book a greater depth than any other account yet published. He also has a personal connection to the people affected by fracking. In an echo of Gasland, which begins with Fox telling a similar story, Gold opens The Boom with a letter to his parents from a gas production company, asking if it could drill under the land they owned with friends in Pennsylvania, in return for US$400,000 upfront and royalties on any gas produced. When later on Gold describes debates in communities worried about the disturbance caused by drilling and the feared threat to water supplies, he can report the arguments from the inside. His approach, filling the book with colourful detail and anecdotes, is not always successful. The jacket promises an “outrageous” story, which oversells it a little: arguments over rock porosity are not exactly The Wolf of Wall Street. But at times, such as his account of the discovery by Mitchell’s team that “shale could be a gold mine”, it is genuinely gripping. To varying degrees, Levant, Gold and Zuckerman are all supportive of the shale revolution. For a comprehensive rejection of its claims, you need to go to Bill Powers’ Cold, Hungry and in the Dark. From its title onwards, the book makes clear that it is not going to be fun. In place of the colourful characters, there are complex monochrome maps, charts and tables, including a double-page spread solely of numbers on well performance from the Gulf of Mexico. It is worth persisting, though, because Powers has looked deeply into the potential of shale gas, studying the data from individual states and gasfields, and concluded that claims that the US has resources to provide more than 100 years of supply, which are often cited by the industry, are grossly exaggerated. He predicts a severe “deliverability crisis” for gas by 2015, as the industry struggles to keep up with growing demand. This kind of analysis can be misleading. One of Powers’ models is Twilight in the Desert by Matthew Simmons, a detailed study of Saudi Arabia’s oilfields that caused a furore in the oil industry when it was published in 2005. Simmons was right in his conclusion that the kingdom would not be producing more than 13 million barrels a day in the early 2010s, as other forecasters had predicted, but his warnings that Saudi production would fall and oil would rise above US$200 a barrel have been wide of the mark. Nevertheless, such debates are a reminder that forecasting is no easier in energy than it is in any other field. The spike in US gas prices caused by cold weather at the start of the year, while not confirming Powers’ thesis, is at least a reminder that expectations of unlimited gas at rock-bottom prices forever were overblown. Powers’ answer is to develop other sources of power including nuclear and renewables, and to make more efficient use of energy. As Michael Levi, one of the most thoughtful US energy analysts, points out in The Power Surge, quite a bit of that is already going on: there are “two unfolding energy revolutions”, not just one. While the “shale gale” has been blowing, there have also been significant advances in solar power, electric cars and vehicles’ mileage per gallon, and Levi, a fellow at the Council on Foreign Relations, does an excellent job of setting the fracking boom in the wider context – in particular, its connection to policies for tackling the threat of climate change. Gas as a "bridge fuel"? His conclusion is that environmentalists and frackers should be friends, or at least recognise mutual interests. In spite of all the uncertainties over climate forecasts, Levi says, it is clear that global warming is a threat, and gas produced by fracking is cutting greenhouse gas emissions right now by displacing coal. Both sides, he argues, should make compromises to embrace old and new energy sources. The idea of gas as a “bridge” fuel that can sustain energy supplies while cleaner alternatives are scaled up has been criticised by many anti-frackers, who describe it as “the bridge to nowhere”. They should perhaps reflect that if you kick away the bridge, you can end up standing on nothing at all. This article was first published by the Financial Times. Ed Crooks is the FT’s US industry and energy editor. China’s shale revolution: will it take off? The rise of unconventional gas in America has proved a “real distraction” from the priority of tackling climate change, Bill McKibben tells chinadialogue. America’s shale-gas industry is booming, but as fears grow over unconventional drilling techniques, environmental regulators are struggling to keep pace. Justin Gerdes reports.